While Bangkok is the favorite haunt of travelers who come to Thailand mainly for shopping and nightlife, Chiang Mai is the quieter version of the Thai capital, with less blinding bustle and perhaps less neon lights, but with an even stronger historical heritage, more green spaces and a modern side that is on par with any other metropolis in Asia. Chiang Mai has a stunning historic center and has almost as many temples as Bangkok, lively and colorful markets where you can stock up on souvenirs and local crafts, as well as plenty of places where you can have a drink in the evening. But if you prefer to spend your holiday budget on visiting the city’s various attractions, you can save some money on food. 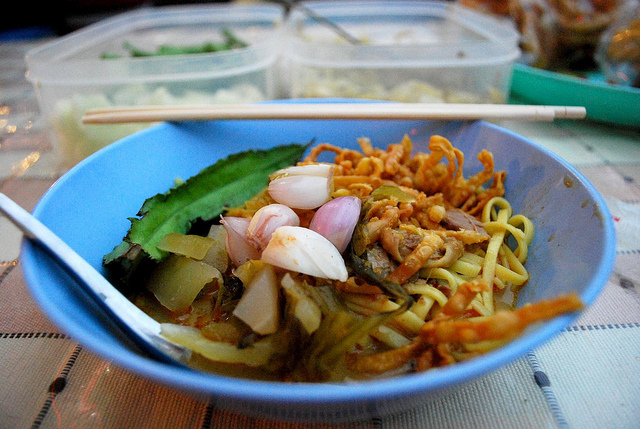 Here are some of the best budget eats in Chiang Mai so you won’t have to sacrifice quality for the price! 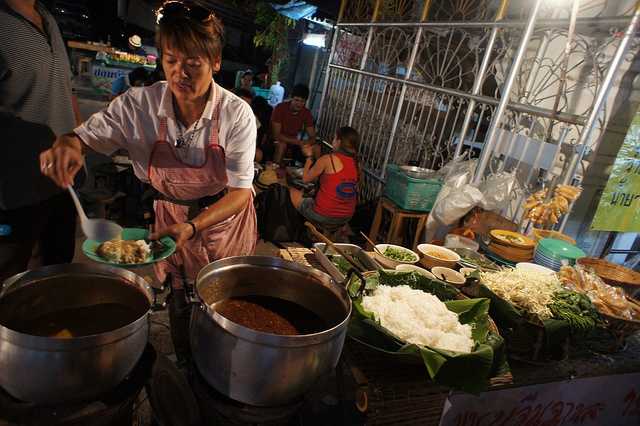 Street food is one of the easiest and cheapest ways to experience Thai cuisine, and Chiang Mai’s street food selection is second only to Bangkok. Anusarn Market in Chiang Mai Night Bazaar is has one of the largest varieties of food stalls anywhere in the city. 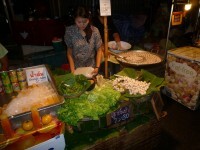 Although the majority of the stalls are set up only at night, there are quite a few permanent shops and eateries that are open throughout the day. Thai food is not the only things you’ll find here – there are lots of stalls selling Indian, Chinese and other Asian cuisines. There’s even an Irish pub that serves excellent stew! Not far from the famous night bazaar you can find Kalare Food and Shopping center, which has some of the bet budget eats in Chiang Mai. This open-air food court has a huge variety of dishes: Northern Thai, Chinese, Western, and Indian, vegetarian as well as seafood. The only problem with the food court is that no credit card payment is accepted, but this is compensated with the live nightly live entertainment, Thai dancing from 9:30 PM. If you want a dazzling culinary experience in the evening, head to Suthep Road around 5 PM and put together a lavish meal from the dozens of food carts set up along the sidewalk. 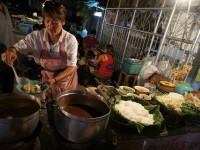 The stalls sell traditional Thai cuisine, so if you want to sample some of the most beloved traditional dishes in Thailand you can grab a few bites at every stall. Funky Dog Cafe serves delicious coffee made from beans harvested by a hilltribe, and almost every single thing on menu is made with local ingredients in a sustainable way. 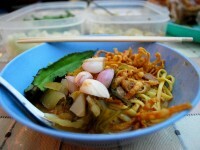 If you’re a green traveler who likes their gourmet food, then you will love the healthy home-cooked food at Funky Dog. The yellow curry is especially recommended! This simple and friendly place sells amazingly delicious food at very affordable prices, and it has a very relaxed atmosphere. The restaurant is diner-style, so guests don’t usually linger, but you’ll be tempted to spend more time than needed savoring a hearty breakfast and a foamy cup of coffee.